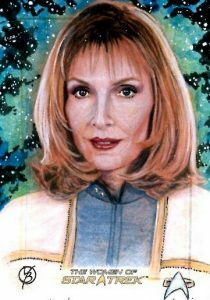 Honoring the iconic sci-fi series with a milestone set that chronicles five decades of Trekkie goodness, 2017 Rittenhouse Women of Star Trek 50th Anniversary takes an overall approach to the franchise, but only for the female characters. Each hobby box delivers three signed cards and a costume relic. While there are several other Rittenhouse releases that also pay homage to 50 years of Star Trek, 2017 Rittenhouse Women of Star Trek 50th Anniversary brings the ladies to the forefront. 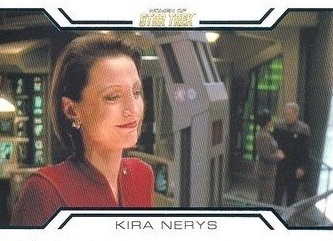 The base set features holo-foil printing technology across 100 cards covering the first five Star Trek television series: The Original Series, The Next Generation, Deep Space Nine, Voyager and Enterprise. The classic movie subjects are also showcased. Providing rarity are the Metal (#'d) base parallels. 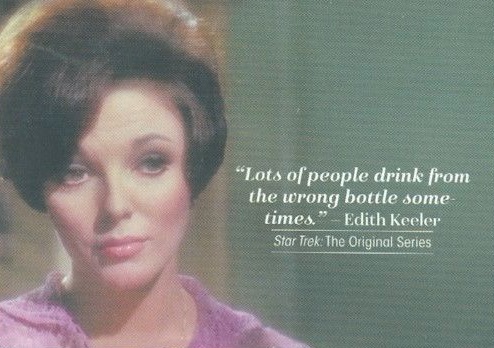 Inserts include Star Trek Women in Command, Quotable Women of Star Trek and numbered Women of Star Trek Gold Metal. However, the hits in the 2017 Rittenhouse Women of Star Trek 50th Anniversary checklist are where the action is. Boasting over 50 signers, the Autograph lineup includes well-known actress Whoopi Goldberg, who played Guinan on Star Trek: The Next Generation, and acclaimed singer and actress Vanessa Williams, who portrayed Arandis in Star Trek: Deep Space Nine. 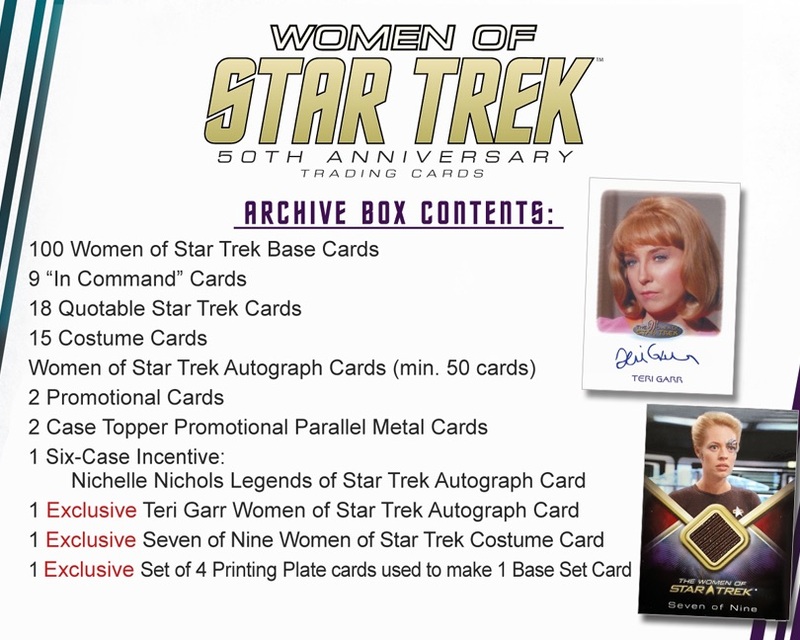 Additional premium elements in 2017 Rittenhouse Women of Star Trek 50th Anniversary include Costume relic cards (1 per box) with actual wardrobe pieces, and hand-drawn Sketch cards, which are a case hit. 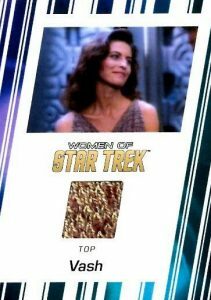 Providing collectors a reason to buy in bulk, 2017 Rittenhouse Women of Star Trek 50th Anniversary also continues the card maker's normal pattern of case incentives. Finally, there is a special album to store the release with a bonus promo card. 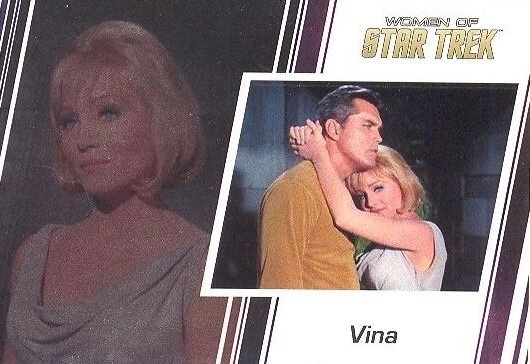 Rittenhouse has previously issued Women of Star Trek sets, including a similar 2010 release along with an earlier In Motion lenticular product from 2000. PARALLEL CARDS: Metal (1:24 packs), Charles Hall Sketch (9-Case Incentive), Printing Plates (Archive Box). 68 cards. 1:8 packs. Shop on eBay. 18 cards. 1:24 packs. Shop on eBay. 19 cards. 1:96 packs. Serial numbered #/100. Shop on eBay. 30 artists. 1:288 packs. Shop on eBay. 2 cards. Not found in packs.